Holidays. They always seem to involve rushing about. And it starts with rushing to the airport. Then rushing to security. Then rushing through the gate because security have held everyone up so long that your flight is on final call. Oh and there’s an elderly woman pushing a pram in the way. I don’t work like that. Holidays are supposed to be for relaxing. I like relaxing. That’s why I go on holiday. Why rush? Lets take it easy. Photograph by VerseVend. Creative Commons licensed. So it came to pass that on Saturday 31 October we arrived at London Euston clutching our tickets, ready to board the 08:50 Virgin Pendalino to Holyhead – step one on our journey to Ireland by train and ferry, and all for the unbelievably low price of £29 each, each way. Given we’d got such cheap travel, and given it was a weekend, and given we were on holiday (yay!) we opted for the traditional first class upgrade, sat back and relaxed. Lack of tea aside, we could settle down on the four hour journey to Holyhead. This is when train travel comes into its own for me – it’s enforced relaxation. Just a chair, a train and a good book, or maybe some TV on the iPod. Lovely. Anyway, relaxation done, we arrived at Holyhead. The ferry port is right next door to the train station meaning we had little to do but wander over. Two companies run from Holyhead to Dublin – Irish Ferries and Stena Line. During the week, you can usually pick from both, and the Stena does get in slightly earlier. However on Saturday, the trains arrive in too late to meet the Stena boarding. Check in wasn’t open when we got there, meaning we could make a welcome stop at the coffee shop, before joining the foot passengers queue. Not ever having boarded as a foot passenger on a ferry, I wasn’t entirely sure what to expect. Also didn’t particularly expect to be grilled for my passport by a load of immigration people wearing stab vests, before being ushered to drop my baggage off – suddenly it was all getting all a little too airport-esque for my liking… We were then herded onto a rather scruffy and packed bus, before walking down a gantry that looked “spartan” to say it politely, but could easily have been used as the set for a Doctor Who adventure where the Doctor runs around a dilapidated space station. Photograph by Bowbrick. Creative Commons licensed. 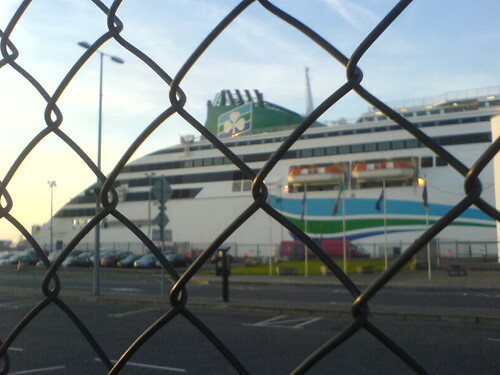 Irish Ferries’s Ulysses is, by all accounts, the largest car ferry in the world. In terms of the number of cars it can carry anyway. And it’s a bit like any other ferry you travel on, in that it’s got all those ferry things. Cabins, shop, lots of eateries, pub, cinema, kids ball pool and, of course, more fruit machines than you could shake a stick at, and a table where you could play Blackjack. Ulysses is so big it has its own walking tour. Admittedly this just seems to be an excuse to just make you walk around the ship to all of the above. So after exploring the delights (ten minutes or so), we headed to the on-board bar for plan B – two pints of Murphy’s and a couple of games of the most excellent Bohnanza. It would be just like being in the pub, and given the highly addictive nature of the game, we’d be playing it all the way to Ireland! Which is why Catherine promptly began feeling seasick and decided she needed to lie down on the seats, which a surprisingly large number of fellow passengers were also doing. This, of course, did leave me with two pints of Murphy’s so was, in some respects, a bit of a result. With no cards to play, there was little to do but aimlessly wander around the ship, and occasionally read my book and wait until we docked in Dublin around half five. In contrast to actually leaving the UK, arriving in Ireland was a pleasure, especially due to the Irish employing the nicest immigration official you’ll ever find, who seemed content as long as you had something red in your hand, and just waved us through with a big smile on his face. Now that’s what I call a welcome to a country!